Leapfrog Press. 2012. 130 pages. 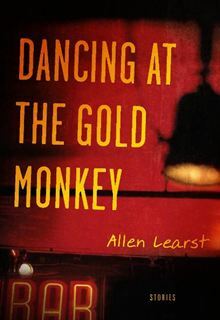 In Allen Learst’s collection, Dancing at the Gold Monkey, a group of Vietnam veterans struggle with the question of what comes next. The question already suggests the impossibility of either healing or forgetting. “Next” only comes in relation to what came before, what came first. No matter where Learst’s characters go, they cannot escape their pasts. That might be why the first story is not set in either Vietnam or the in the war’s aftermath, but in Michigan, in 1957. Its last scene is stunning: the anonymous narrator imagines himself under an icy lake, hoping that his institutionalized mother will kiss him. Ice is an ideal illustrator of his and of all Learst’s characters’ paralysis. Events seem to spiral outward from there, with the past and ice images haunting everyone, even those the narrator does not know, in places he has never been. But even though all the relevant characters suffered from the war either first or secondhand, no clear map of the connections between these stories can be traced, because conventional linearity is absent. It has to be: for them, time does not move forward. Instead, the narrator says that “It’s [always] then and now, the most difficult place to be.” It may be better to read these stories as collages or patchworks in which the past and present have been cut apart and sewn back together, often to fantastic effect. In this regard, and in regard to theme, they are reminiscent of Denis Johnson’s Jesus’ Son. This is most evident in “A Sheet, A Clothesline, A Bed.” It begins with another question: “What is it?” The anonymous narrator and his buddies are wandering a Vietnamese beach when they come upon “it.” He is loaded with drugs, barely able to hold onto his tale’s thread: “. . . bloated . . . man . . . pilot. Words in the surf. The silk unmakes itself into a fighter pilot stuffed into a G-suit.” The pilot is the corpse of Bobby Spendlove. While his friends drag along the body, the narrator staggers behind them, unable or unwilling to help. The story’s next two sections take place after the war and in America. They too begin with questions: “Where are we?” and “Where does time go?” The narrator ends in a VA hospital, flashing back to the war, thinking of his buddies, living off cigarettes and the small attentions of his nurse. Learst’s use of the second and third person in other stories offers other illustrations of how the simultaneity of past and present has damaged the narrator’s fellow soldiers and their loved ones. In “Point Man,” Micky is not only shooting rats on the Clinton River Spillway, he’s with his squad in Vietnam. In “Take Me to the Gold Monkey,” Micky’s wife Jean is both waiting for a cab on the street and with her mother in the family home. The splicing of past and present, and even of, on occasion, imagined pasts and presents, also recalls Johnson’s work. But Learst’s characters do not share Fuckhead’s literary bent. They are more blue collar, plainspoken. Micky’s most powerful metaphor occurs on an icy lake, when he says that “There’s a whole world under the ice.” But it works. That world, at its best, is clear and concrete. It can be touched. But it cannot be escaped. In the last story, “Gondwana,” the anonymous narrator returns. He watches his neighbor Irene get robbed slowly, over the course of several weeks, by her son. He holds a gun ready, loading and unloading the chamber. It becomes clear, though, that he will do nothing to help this woman. In the closing paragraphs, Irene’s son turns out the lights and leaves her behind. The narrator knows that this is wrong, but he only watches the dark. He reloads the gun. We leave him in that position. He is there. Elsewhere too. MARCUS PACTOR's collection of stories, Vs. Death Noises, won the Subito Press Prize. His fiction has recently appeared or is forthcoming in Menacing Hedge, The EEEL, EAT Flash, and Heavy Feather Review.